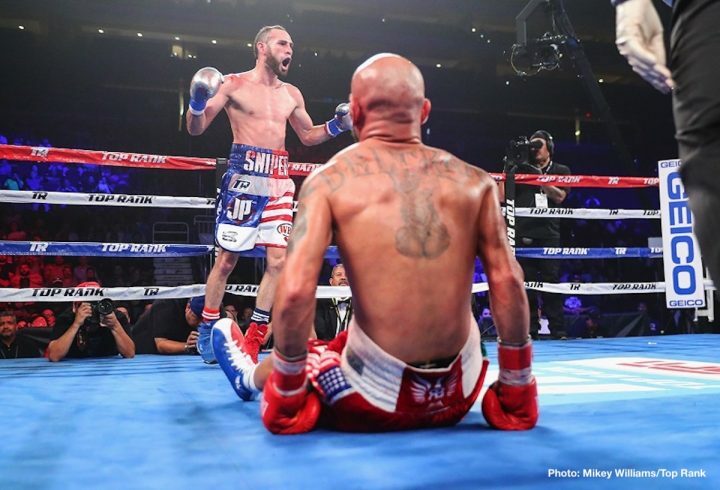 By Chris Williams: After beating WBO lightweight champion Raymundo Beltran last Saturday night by a 12 round unanimous decision, Jose Pedraza is now ready to take on WBA champion Vasyl Lomachenko in December in a unification fight on ESPN+. Pedraza (25-1, 12 KOs) says he has the fighting style to defeat former three division world champion Lomachenko (11-1, 9 KOs) later this year. Pedraza, 29, beat the always tough Beltran 35-8-1, 21 KOs) by the scores of 117-110, 117-110 and 115-112. Pedraza dropped the 37-year-old Beltran with a perfectly timed left uppercut in the 11th round in their fight on ESPN+ last Saturday night at the Gila River Arena in Glendale, Arizona. It was a master class performance by Pedraza, who showed the same amazing boxing skills that enabled him to defeat excellent fighters like Stephen Smith, Andrey Klimov, Edner Cherry, Michael Farenas, Antonio Moran, Sergio Reyes and Tevin Farmer. Recently, Farmer captured the International Boxing Federation super featherweight title. Pedraza easily beat Farmer six years ago in stopping him in the 8th round. That fight showed what a talent Pedraza is. Last year, Pedraza lost to the young wizard Gervonta Davis by a 7th round knockout. Instead of the fans giving Davis credit for being a highly gifted fighter, the fans downgraded Pedraza by saying he was never a good fighter to begin with. “Now I can talk about the future. I want to unify the division. I want to battle against all the champions. I want the big names. Bring Lomachenko! I have the perfect style to beat him,” Pedraza said to ESPN.com. Pedraza will be viewed by fans and the odds-makers as having very little chance against Lomachenko when that fight happens. Pedraza is capable of changing stances to throw Lomachenko off, but he’s going to need to work on his punching power for him to have a real chance of winning the fight. Just boxing Lomachenko isn’t going to be enough for Pedraza to win. He’ll need to put some pressure on Lomachenko and come up with a good body attack with power behind it for him to defeat him. The only guy to beat Lomachennko at the pro level is Orlando Salido, who was able to wear the Ukrainian down with his body punching to defeat him by a 12 round decision in 2014. Lomachenko is a great fighter, but he’s not infallible. He makes mistakes just like any fighter, but he doesn’t make a lot of them. Jorge Linares was able to drop Lomachenko in the 6th round when he foolishly walked straight at him with his guard down in their fight three months ago on May 12 at Madison Square Garden in New York. It’s hard to imagine Pedraza being able to out-box Lomachenko. That’s not likely to happen, which is why it would be best for Pedraza to mix in some slugging in order to try and force Lomachenko to be cautious in his attacks. It won’t be good for Pedraza if Lomachenko is able stand on of him in every round, throwing his rapid machine gun shots repeatedly to try and force him to quit like many of his past opponents have in the last. Lomachenko made these excellent fighters quit against him by focusing on high volume punching: Guillermo Rigondeaux, Jason Sosa and Nicholas Walters. Now that Beltran is out of the picture, Pedraza will be the dance partner for Lomachenko, 30, to fight on December 1 on Top Rank Boxing on ESPN+. It’s suddenly a more interesting fight date than the one that most fans assumed it would be for Lomachenko if Beltran had been his opponent. Beltran is too much of a plodder to have a chance against a master boxer like Lomachenko. Pedraza probably won’ have much of a chance against Lomachenko either, but at least he possesses the boxing skills to make it an interesting match. Pedraza landed 160 of 556 punches for a connect percentage of 29. Beltran connected on 137 of 515 shots for a 27 connect percentage, according to CompuBox’s stats. The punch stats for the Pedraza vs. Beltran fight don’t tell the whole story, however. Pedraza dominated almost every round. Boxing News 24 had Pedraza winning 9 rounds to 3. Looking at the punch stats, one would assume that the fight was pretty much even, but that’s not the case. Pedraza was getting the better of Beltran through most of the contest. Pedraza, who goes by the nickname, ‘Sniper,’ was picking Beltran off with single shots as he would plod forward. Beltran was fighting with his normal plodding fighting style, and it was all wrong for him in facing a slick boxer like Pedraza. Beltran needed to fight with a different style for him to have had a chance of beating Pedraza, but he wasn’t equipped with the talent needed for him to adapt his game to what the Puerto Rican fighter was doing. Pedraza will need to fight a lot better against Lomachenko than he did in his 7th round knockout loss to Gervonta Davis last year. The good news for Pedraza is Lomachenko doesn’t possess the hand speed, power or the fast movements of the 23-year-old Davis. Lomachenko is a talented fighter, but he’s not as big, fast or as powerful as Gervonta. Lomachenko started his career out at featherweight. He’s not naturally big guy like Gervonta. Lomachenko didn’t look that great in dealing with the boxing skills of Jorge Linares last May. Lomachenko was able to eventually drop Linares in the 10th round with a body shot, but it wasn’t the dominating performance that the fans had been accustomed to seeing from the Ukrainian fighter. Lomachenko suffered a shoulder injury early in the fight, but even before the injury, he was having problems with Linares’ skills. Pedraza has the same kinds of talent as Linares possesses, but he’s more of a long range fighter. Pedraza, 5’8 ½”, will likely stay on the outside and use his powerful jab and his long five inch reach advantage to keep Lomachenko from landing his shots. Lomachenko, 5’7”, is one and a half inches shorter than Pedraza, but he’s giving almost half a foot in reach. That could prove to be a problem for Lomachenko when he tries to get in close enough to land his shots. Beltran has got to be feeling pretty down right now. He had toiled away in the pro ranks for 19 years before he finally captured a world title last February in beating 40-year-old Paulus Moses to win the vacant World Boxing Organization 135 pound title on February 17. Beltran had hoped to successfully defend his WBO title by beating Pedraza to then face Lomachenko in a nice payday fight on December 1. Unfortunately for Beltran, his title run ran out in facing Pedraza. Beltran has always struggled during his career when facing boxers, so his promoters at Top Rank did him no favors in matching him against Pedraza rather than a slugger. It’s not over for Beltran. Top Rank can move him around and perhaps he’ll get lucky once Lomachenko, Mikey Garcia and Pedraza move up in weight to light welterweight. The bad news is Gervonta Davis is moving up to lightweight, and he’ll be a problem for a fighter like Beltran if he ever has the bad luck of fighting him.